While designing the admin template the User Interface plays the major role. With these templates, you need not care about conversions as you would do in landing page templates. You have to purely think of making the dashboard user-friendly and improve the productivity of the day to day task. To achieve this you will be needing tons of useful web elements. If you are about to start a project from scratch it will take so much of your time. We have collected free HTML admin templates which has all the basic elements and features pre-designed and developed for you. In our previous free admin template collections we have collected admin templates of all categories. In this post, we have collected admin templates that are developed in HTML. So the developers and users who are in search of a particular type of admin template will find this list useful. Most of the free HTML admin templates in this list uses the latest HTML5 framework, hence you get modern web elements with a more natural look. 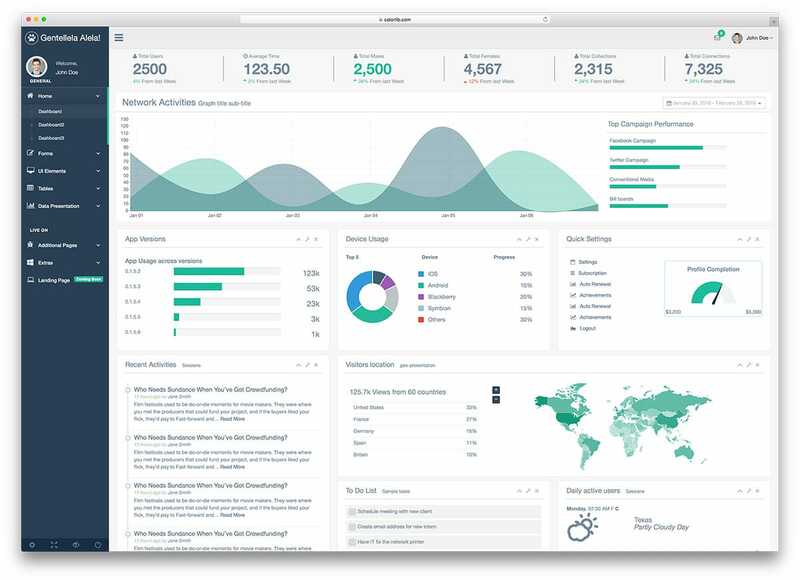 Some of these free HTML admin templates give you all elements and charts to create an effective dashboard. While some of them give you only limited options since it is free. Based on your needs select the best template for you. 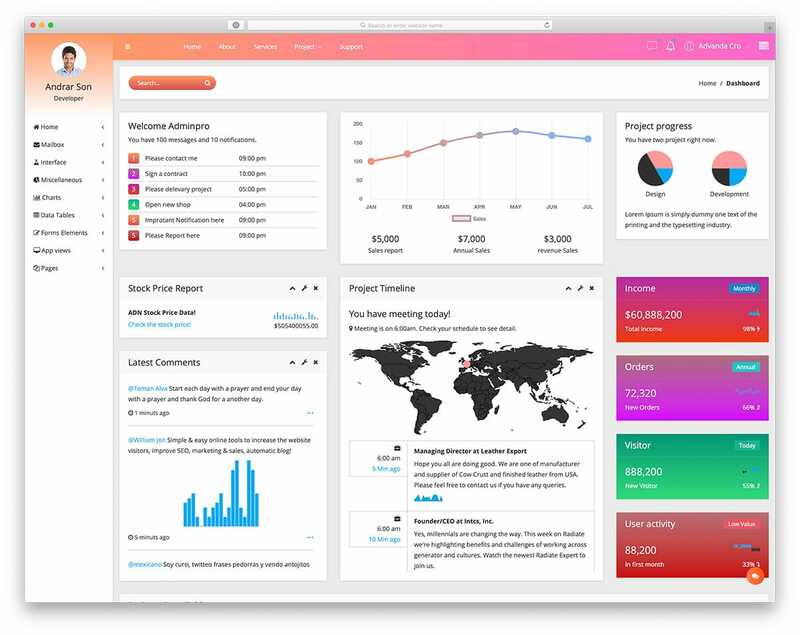 The creator of the Concept admin dashboard has given you a premium quality material for free. Unlike the other freemium model, this one doesn’t have any restrictions on the options and features. You can use all the features and options given in this admin dashboard. With the default options itself, you can create a proper admin dashboard in no time. In the demo, you can see that the creator has given you four pre-made dashboard designs for you. If you are making a dashboard for any one of the sample designs given, then you can set up a dashboard in no time. Latest development frameworks are used in this template, so you get interactive and useful features with this one. Adminator has already been mentioned in our previous dashboard template collection. The premium quality makes this template to hit the first spot again in this list. When we think of free template what we generally expect is an ok-ish design and one or two basic functionalities. But with the Adminator you get pixel perfect design with all the basic features developed. The immaculate design of this template has all the web elements placed in the right spot. Plus the clean white background makes the colorful icons and elements striking. This template follows a sticky left sidebar navigation which shows the option icons in the collapsed condition and clearly shows the label when the options expand. With this template, you get options for emails, chat, charts, forms and all major elements you expect in an admin template. For developers, this template will be a good base, with the Adminator they can develop a project from scratch and can complete it within no time. Octopus is a multipurpose admin template with elements for almost all famous categories. If you have to track multiple tasks simultaneously, this template will help you greatly. With big widgets and smooth animation effects, this template helps you manage the widget easily. The creator of this template has made the widget easy to minimize and given options for each widget separately. If you wish to give users the flexibility to choose their own widgets, then this template will be the best user choice. It takes lots of effort to create such a flexible template, but it worths the time if you are making it for users. All the navigation options are kept in the left sidebar and the activity options are kept right sidebar. 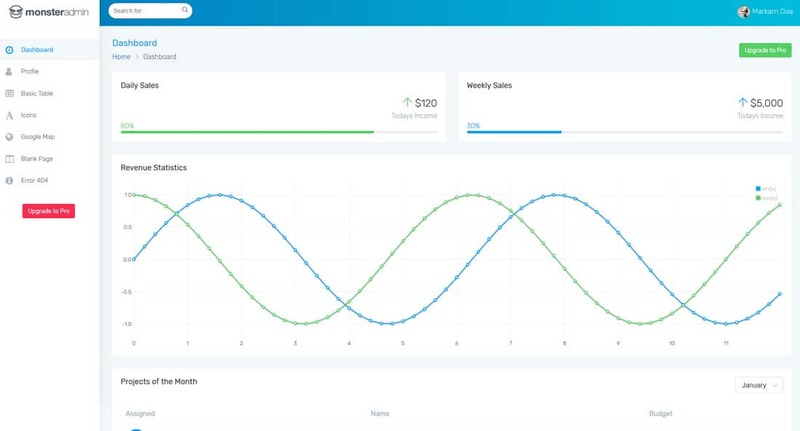 Plenty of charts and dashboard elements are given in this template so you can set up a user-friendly dashboard in no time. Even if you need to add your own unique element you can add it easily in this template. The creator of this template has made the code structure easy for developers to customize. 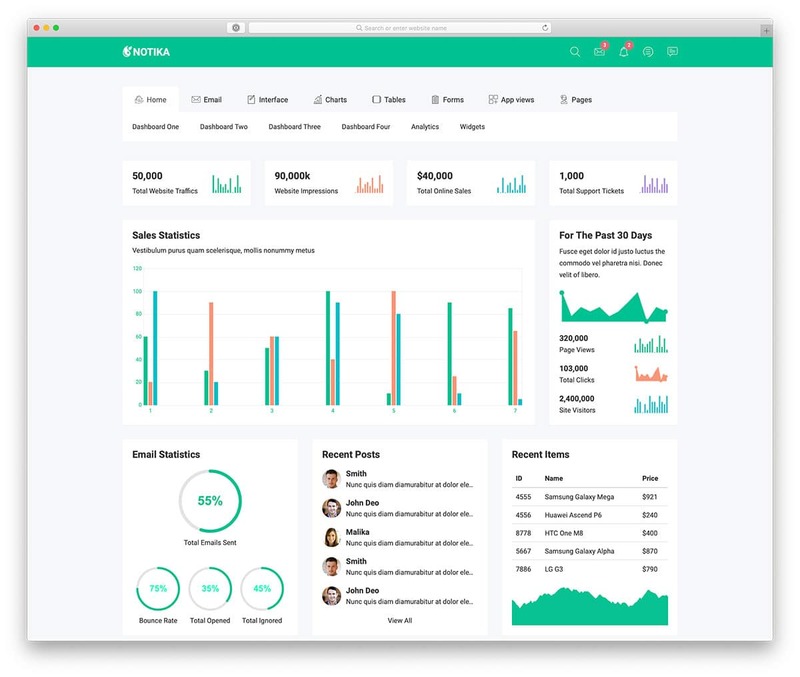 Notika is another feature rich admin template. The designer of this template has made use of the full-width layout with big dashboard elements. Instead of using the sidebar navigation, this template uses a tabbed interface. You can organize the widgets and sub menus easily with this tabbed interface. All the widgets under each category are made big enough to show the content easily. Interactive live charts and map widgets are also given in this template to make admin job easier. Live chat tool Tawkto is also integrated with this template to help you manage customer query from the dashboard itself. 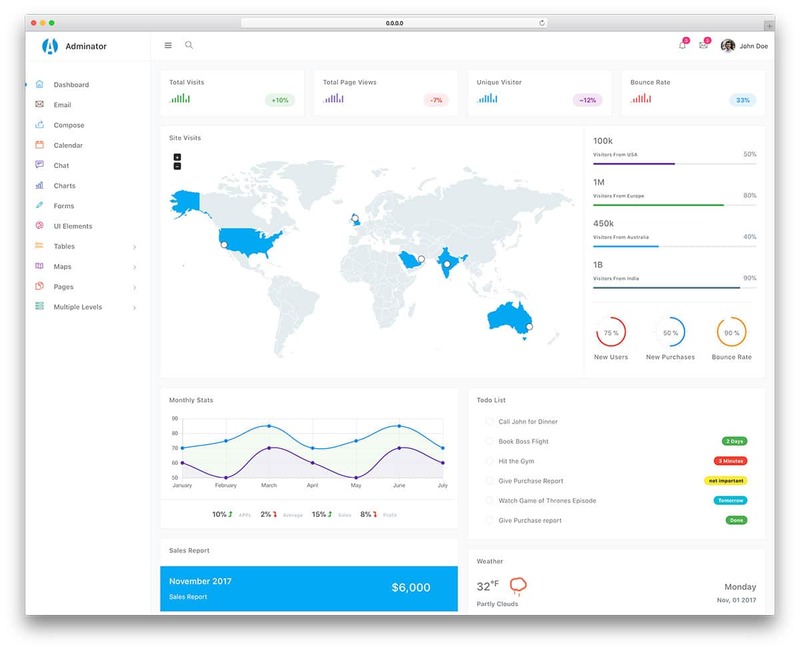 If you are a SAAS company, from the dashboard itself your customers can get the help for the application. All basic charts are given in this template so you can visualize the contents elegantly without any issue. Even if you need you can add charts of your choice, by making a few customizations to the code. Animation and visual effects are smooth across all devices. The creator of this template has done all the basic optimizations that you expect in a modern website template. Dark mode is the current trend between the developers and the users. All major applications like Twitter and operating systems Mac and Windows 10 are using dark mode. Long awaited Youtube dark mode for Android users are also out now. If you also want to join the trend, then the Nalika is the best dark theme admin template. Texts and icons are made big in this template so that the user can easily see and interact with the dashboard. On the dark theme layout, the colorful charts look more vibrant and distinct from each other. All the navigation options are given on the left sidebar and the profile controls are given on the right sidebar. Lightbox effects are used to show notifications and activity status. If you are creating a web application to manage your employees, then this template will be of great use to you. 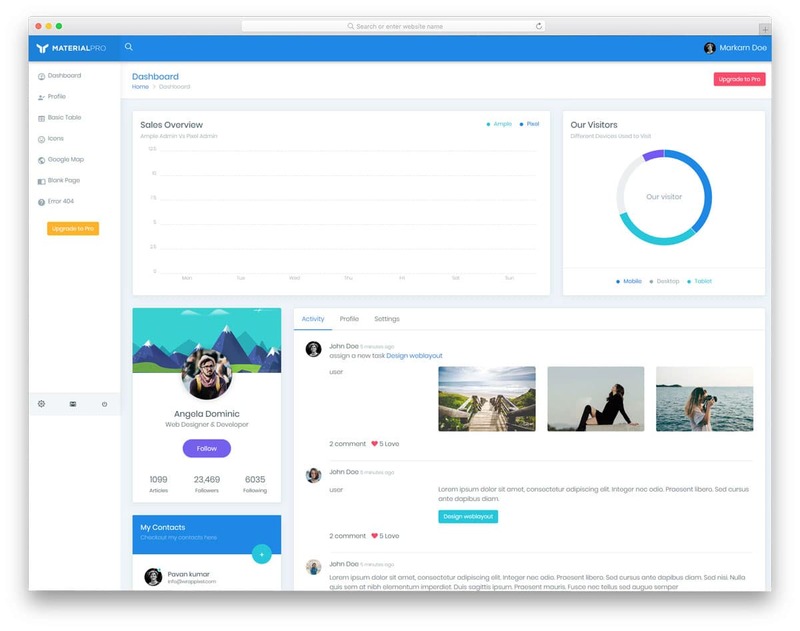 Each user can have their own profile and see their tasks and their progress. By keeping this template as a base you can create an effective web application for your employees. One of the major disadvantages of free HTML admin templates is they are limited with functionality. Even if you find some good quality freemium template, you don’t have enough elements to use it to the fullest. For those who are frustrated by the limited functionalities, the Adminpro is the best option for you. The creator of this template has given you seven admin variations and each has its own unique design. All the admin templates have all the elements and graphs to set up an effective admin template in no time. Development side is also made easier with this template; code structure of this template has made flexible enough for easier customizations. Even beginners can work with this template easily, if you are a beginner, take a look at our easy to work free simple CSS website template. Overall the Adminpro is a must-have template for web developers and web application developers. Kiaalap is a material design admin template, just like the Adminator template mentioned above. With the super clean design, this template gives the best user experience. The designer of this template used each and every screen space effectively so that the user can clearly see more information. All the basic charts and UI elements are given in this template as a package for easier dashboard set up. Google has recently released its updated material design for more smooth user experience across all major devices. The elements are more round with lively colors in the new material design. Since this template is also designed on the base of material design, you can easily adapt to the latest trend with fewer customization. With this template also you get the free chat tool Tawkto. All you have to do is to finish the setup and start engaging with your customer. 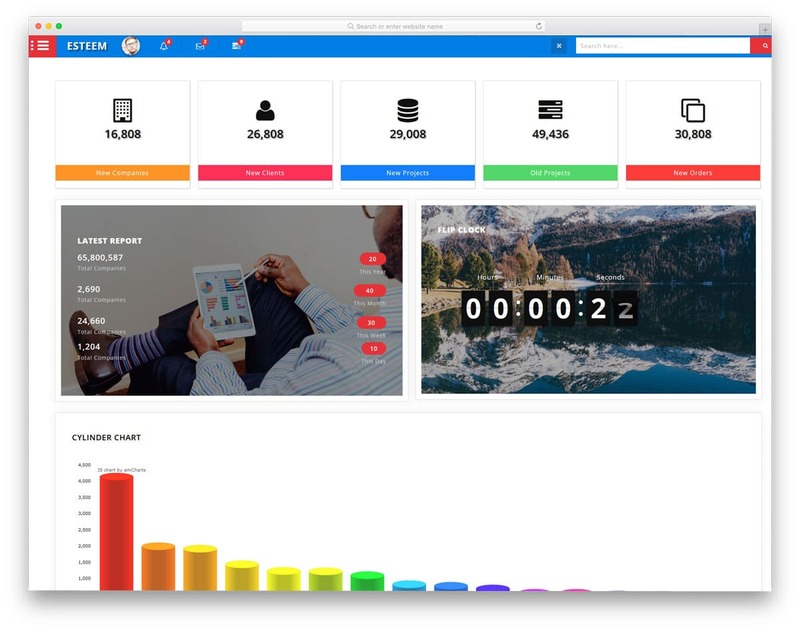 SRT Dash is a bold looking admin template with pop colors. If you have to deal with multiple data at the same time, the chart widgets in this template will help you keep track of the records easily. Since this template is designed with the financial theme, you get financial elements in the demo dashboard. But, this template has plenty of other user elements and charts as well, so you can use it for other types of dashboards. Another unique feature of this template is the full-page view. Though the widgets are bigger with clear design, seeing the contents on a full page will give an uncomplicated feel to the users. For a better view, you can even minimize the sidebar. The transition effects and the visual effects are smooth with precise scaling for small screen devices as well. With this template, your users can easily access the admin panel from their handheld devices itself. Jeweler is a bright looking admin template with big widgets and bold texts. This template is designed for the eCommerce stores. 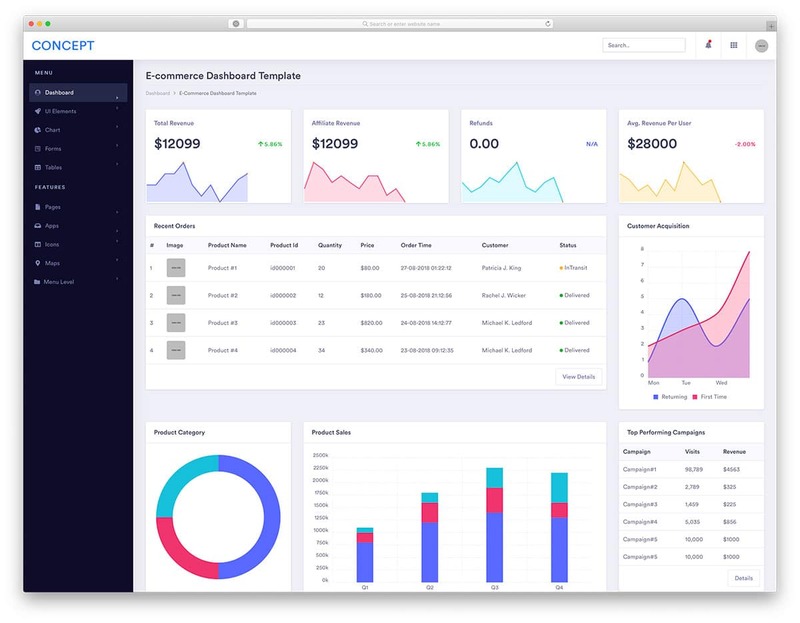 If you are a small online store owner, this dashboard will help you keep track of your store performance and sales. You can even see the live update of your product stocks. A calendar widget is also given in this template to help you plan your shipping and other events easily. Apart from the dashboard navigation you also have primary navigation options at the top bar for your website pages. If you need you can use this space for other purposes as well. As this template uses the latest HTMl5, CSS3 and Bootstrap framework, the template is fluid and loads faster. Basic optimizations like speed optimizations and mobile device optimizations are also done in this template. Shadow and depth effects are used to differentiate each widget from the clean background and bright borders. 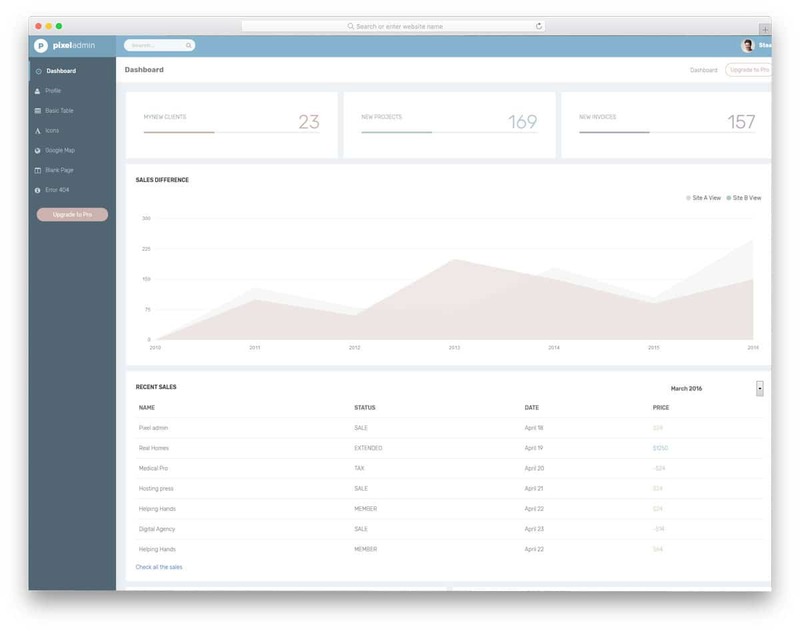 Sufee is a fully functional HTML admin template. In most of the free admin templates, you will get just the framework and some of the options are used only for the demo purpose. But with the Sufee template, all the options provided are in a complete working condition from the front end, all you have to do is take care of the backend. Since this template is built with latest HTML, CSS3, and Bootstrap version the developers will find it extremely easy to work with it. In the top bar, you have the space to add profile info and notifications. The animated stats value give this template a lively feel. With this template, you get basic pages pre-designed for you. Along with it you also get dashboard elements like tables, forms, and icons designed with the same quality. 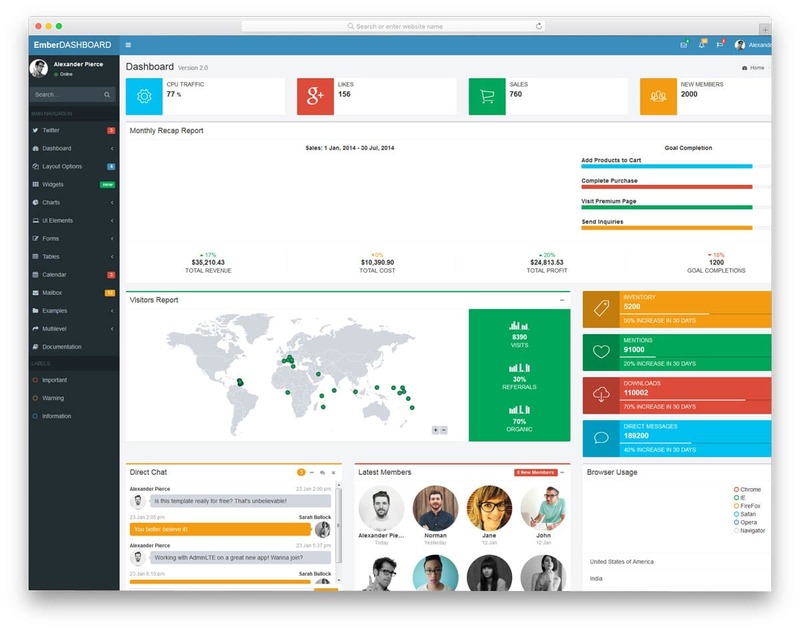 ElaAdmin is an attention grabbing free admin template. The design and code quality of this template is almost similar to the Adminator template mentioned above. What makes this template unique is its visual effects. The professional animation effects give this template a rich premium feel. When I say professional effects, it’s been used only at the required elements where you expect the user to see immediately. 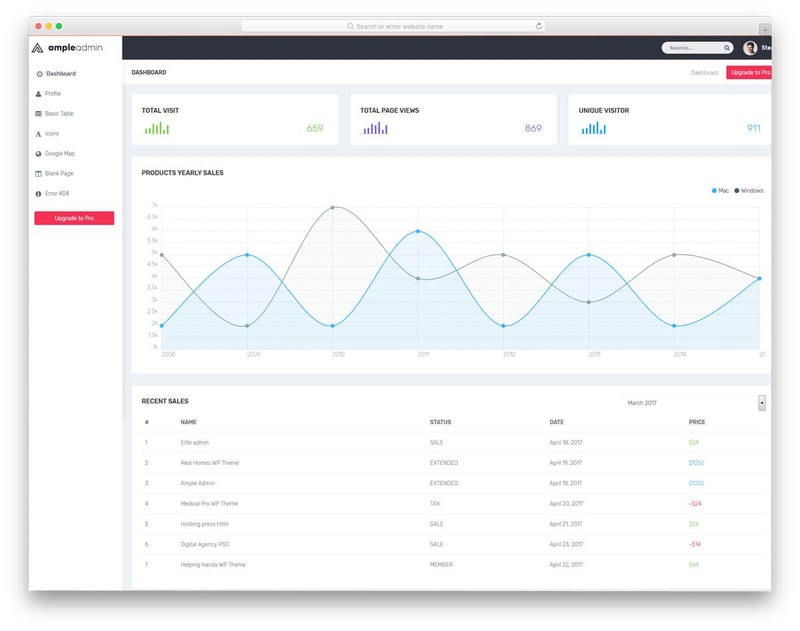 In the demo version, you get two admin dashboard concepts, one is for analytics and the other is for the e-commerce. In the top bar near the hamburger menu icon, you have the option to include a call to action button for contact form and links to other pages. Since this template is from the creator of the Adminator template you get all the dashboard elements and options similar to the Adminator template. 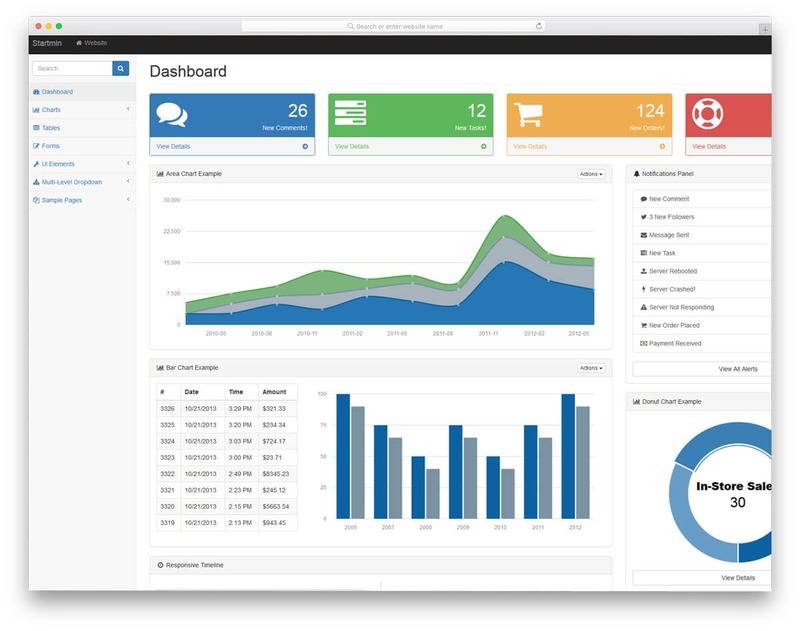 Overall the ElaAdmin is a feature rich interactive admin template. 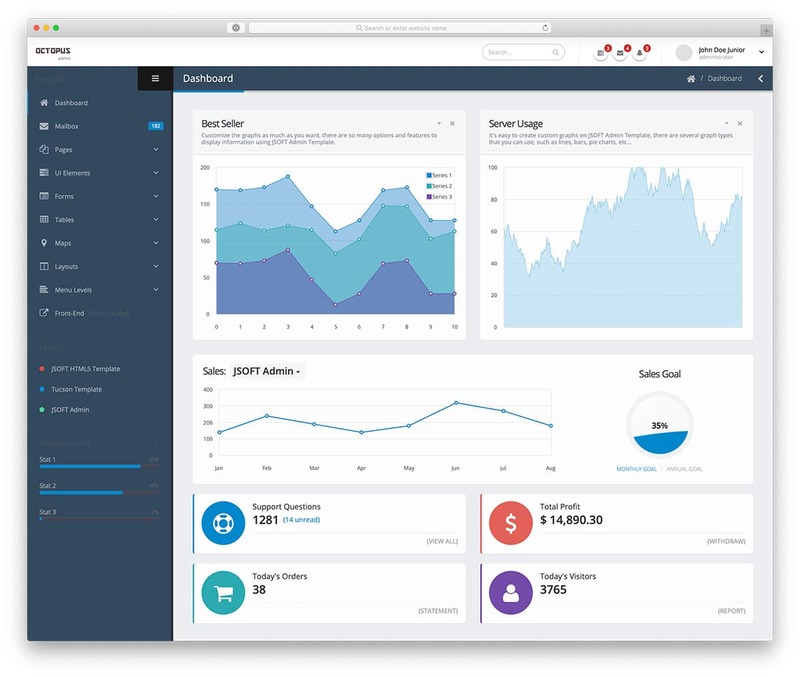 Gentelella is a classy looking bold HTML admin template. If you are a data-savvy person you will love this template. This template includes many elements to present head rotating stats in an interactive way. In the free version itself, you get three dashboard variations like you get in the premium templates. The developers have used the hover effects smartly to show the precise data of the graphs. The navigation menu is adjustable if the user feels it obtrusive while seeing the data they can hide it with a click. In the sticky left sidebar you have the option to include navigation option and in the footer, you have the option for settings, full-view, and log out option. Both in the top bar and in the sidebar you have the place to include user profile picture and welcome message with the username. 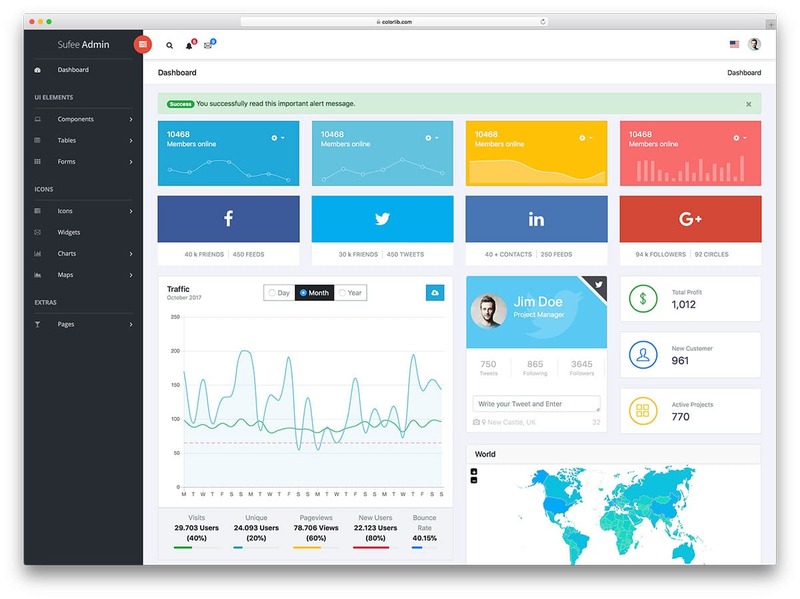 CoreUi is a freemium type HTML dashboard template. The case with the CoreUI is almost similar to the freemium type website templates. Either you get only the basic options or all the options with restricted functionalities. But the plus side of a freemium template is you get a well-designed and well-coded template for free. If your demand grows in the future you can upgrade to the pro version without sacrificing the look and the functions you been using for a long time. With this template, you get both the options to hide and collapse the navigation bar. In the shrunken condition, the menu option shows the menu label and subcategories when the user hovers over it. On the top bar, you have the option to provide profile related information and notifications. To the top right corner, hamburger style option is provided to show schedule, chat, and settings. 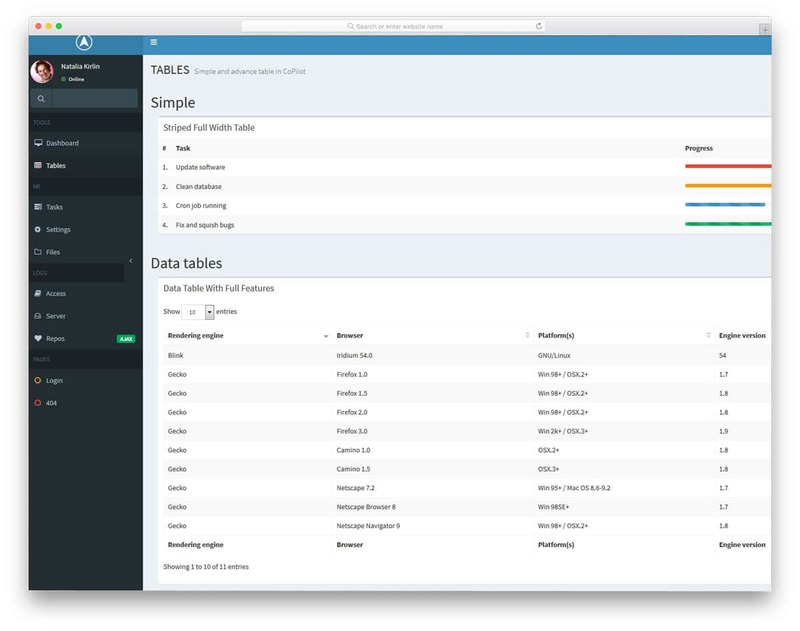 Overall CoreUI is a feature rich template with lots of options for both users and developers. 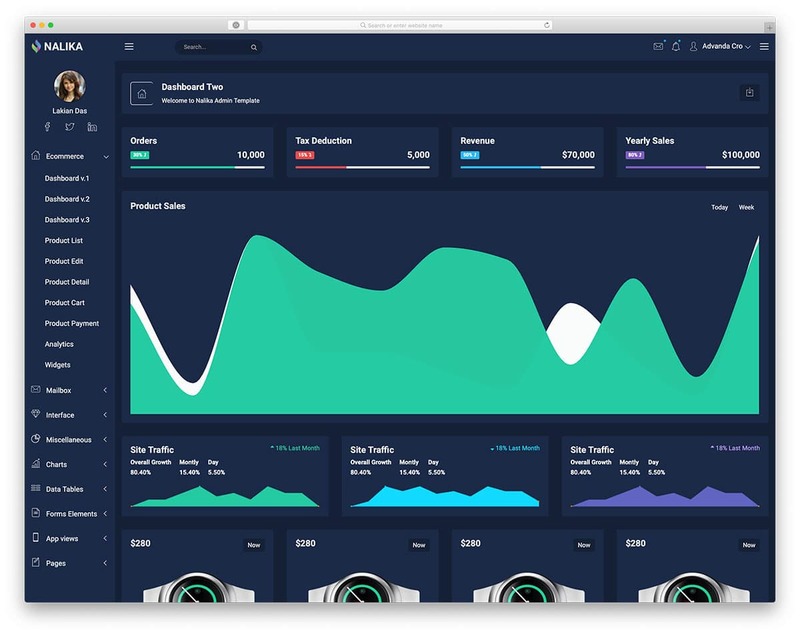 Material Dashboard Lite is a dark theme free HTML admin template. Mostly the admin templates are designed in a clean white light theme, this template is designed especially for the dark version lovers. The greyish color scheme of this template not only make the content appear cleaner but also gives a royal look to the template. Each option in the dashboard is given in different content blocks, so you get plenty of space to see the stats neatly. The material dashboard lite template gives only a limited amount of element and block options. This template gives you UI elements and maps. With the UI elements you get basic components like buttons, icons, and animated progress bars. With the map, you get an interactive map in which the location pins have small animation effects. 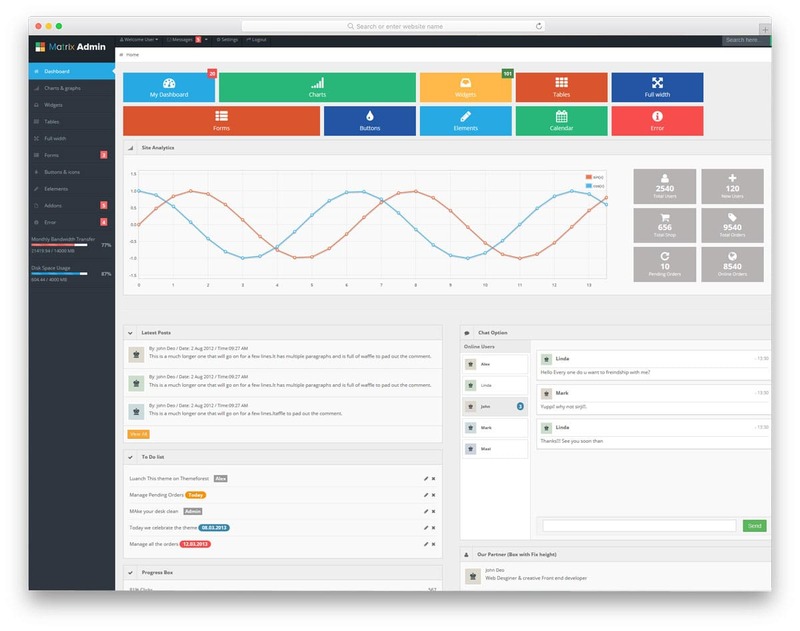 This generic dark theme admin template is flexible and based on your need you can make a simple dashboard. If you are a simple design lover, check our simple website template collection. 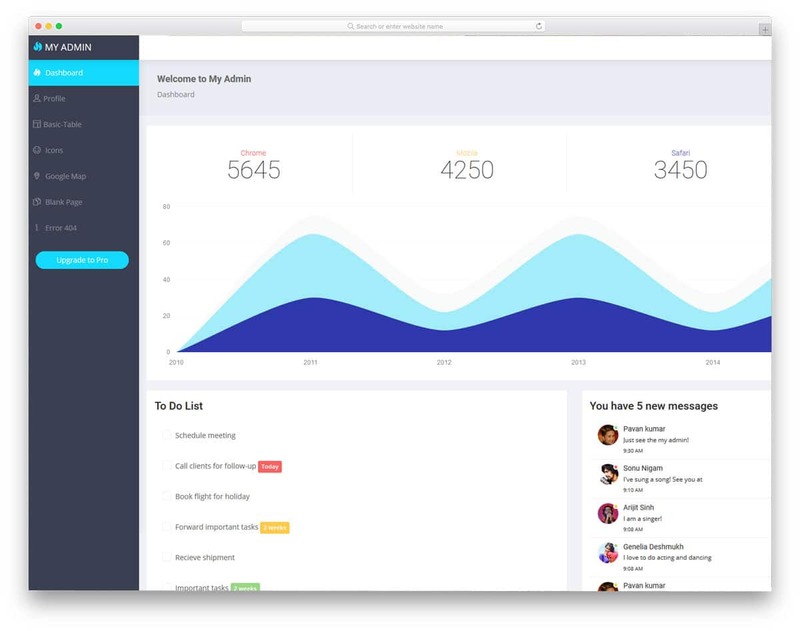 Bulma is a bold looking HTML admin template. In the demo, the default design of the template matches for an analytic dashboard. 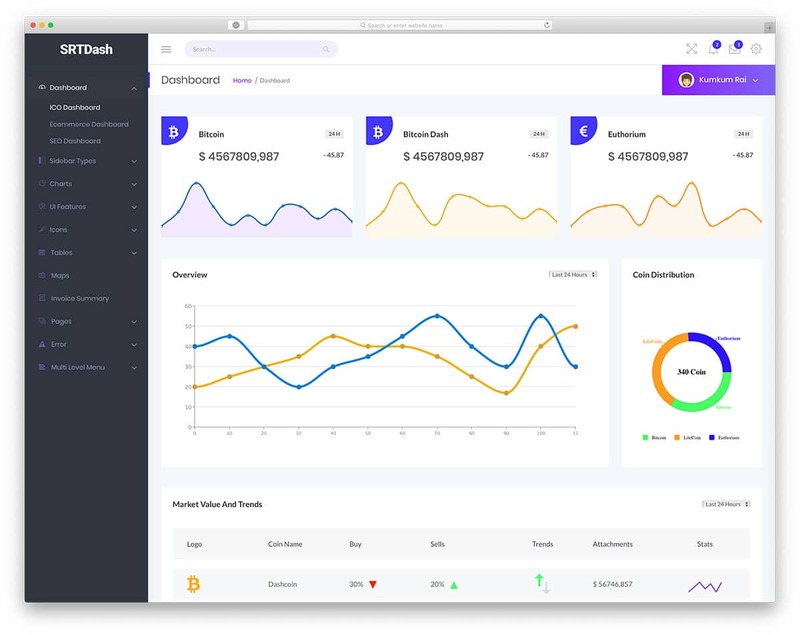 In the dashboard, you have plenty of blocks for charts and graphs. The flat color options to indicate different parameters is a wise choice, the user can identify the category by their colors itself. The balanced use of CSS and JS file gave this template a unique look. It looks elegant and at the same time, the visual effects used helps to improve the productivity of the template. The options given in the left sidebar navigation may remind your WordPress admin dashboard. This template is responsive, so the users can use this template even in small screen devices. For web admins who need to maintain a huge team and to monitor their workflow as well your site performance, the Matrix Admin is the best choice. 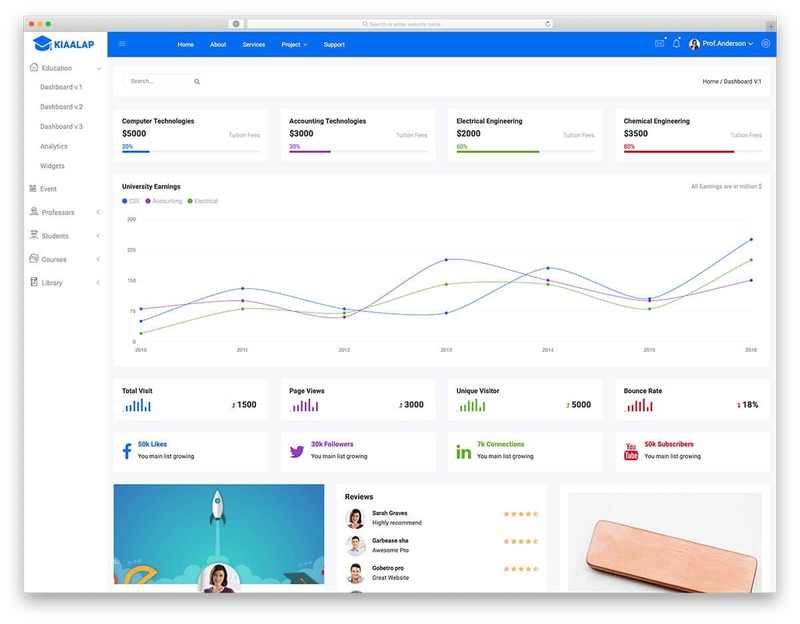 The long dashboard design gives you ample amount of space to add tons of useful blocks and elements. As a tradeoff to include all the elements and blocks the text size in this template has been reduced. The readability on small screen and mid-screen devices like notebooks and iPads are not that great but it is manageable. The flash notification for new incoming emails makes sure that you will never miss an email again. Speaking of the visual effects, this template uses subtle animation effects. For people who find animation effects on their dashboard as annoying, this template will help them. With this template, you get lots of elements like widgets, forms, icons, elements and much more. Ample Admin Lite, as the name implies it is a simplified version of a premium template. Though it is a lite version you have the basic features covered in it, users without any high demands will find this template useful. As many of the free HTML admin templates on this list, the Ample Action also uses a light skin. On the clean white background, the texts and the dashboard elements are legible and easy to read. Plus the white background adds more richness to the colorful stats and dashboard elements. Since this template uses font awesome icons, adding extra features to the menu and integrating them won’t be an issue. The smooth rounded edges will easily help you notice that it as a modern template. As it is a lite version the elements and options you get with this template is limited. 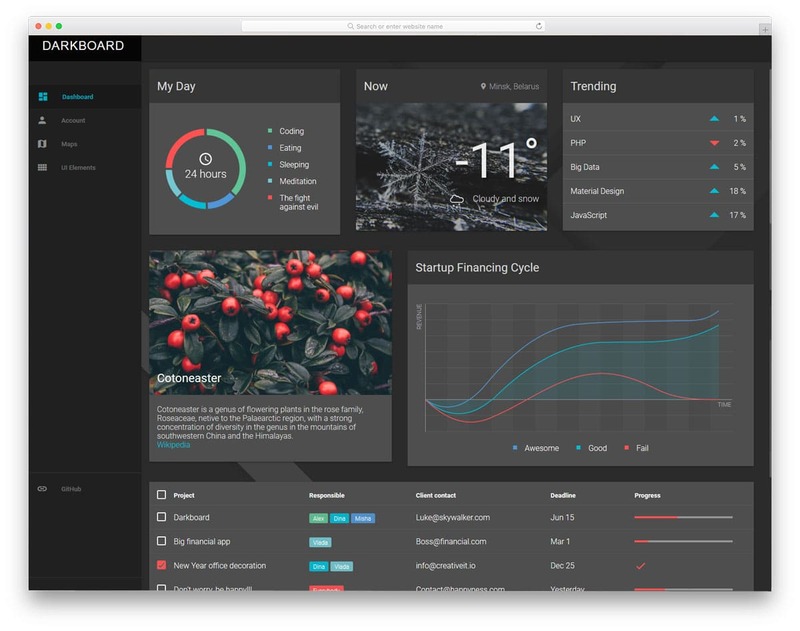 Startmin is a professional dashboard template. It is a typical free HTML admin template, you don’t get any eye-catching trendy web elements and colors with this template. But the template gives you a neat layout with necessary dashboard elements. The clean white space helps the text and the web elements appear neatly. 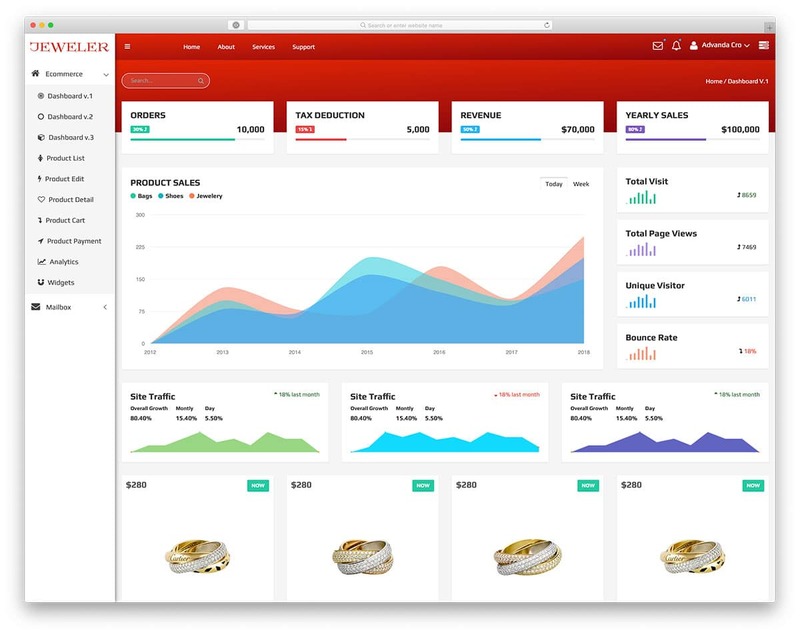 In the demo version, the default dashboard you get is designed for an e-commerce site. 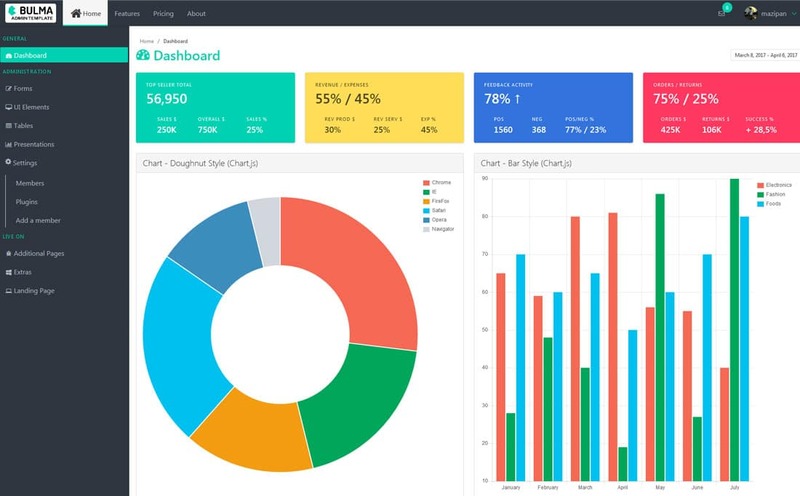 With this template, you get a number of UI elements, charts, tables and multiple drop-down options, with these you can customize the dashboard to your own custom needs. In the dashboard, apart from the sales stats you also have the blocks for notification and chat. 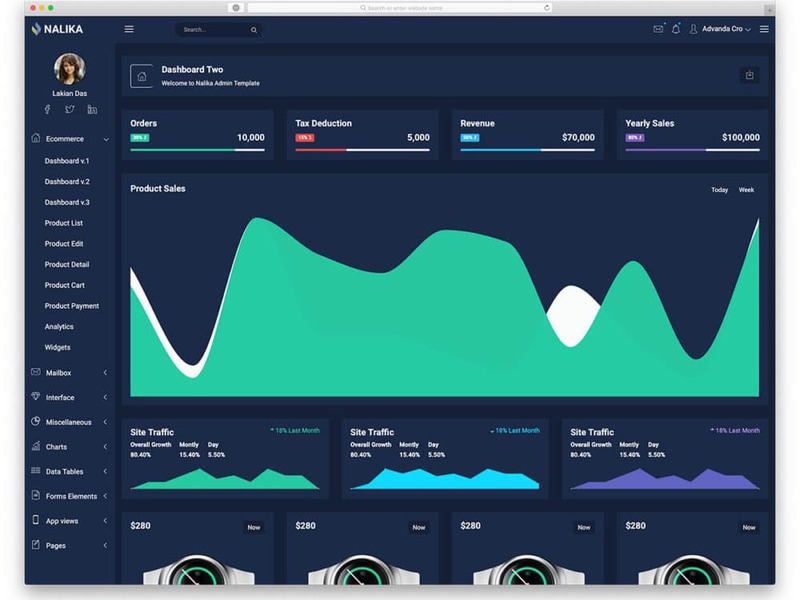 CoPilot is a modern dashboard template with trendy dashboard elements. The precise design of this template makes the important info appear clear by making the other supportive elements smaller. If you need to see the stats clearly on the big screen you can minimize the sidebar navigation. The dashboard only supports stats and charts in the demo version. Since the elements you get with this template is limited customizing the template would be a tough job. You need to create the elements first, which makes this template a choice for a developer not for general audience. 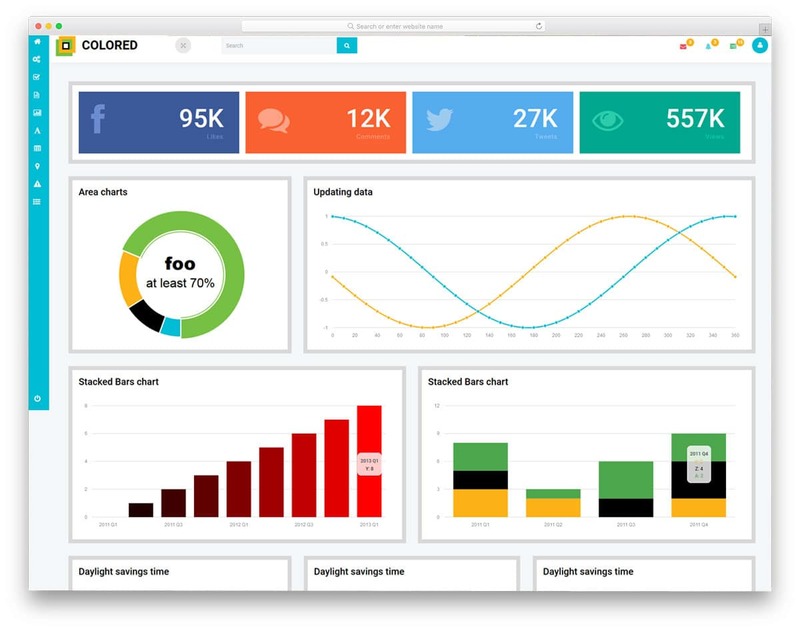 Overall with the CoPilot template you get interactive visual effects and neat charts. 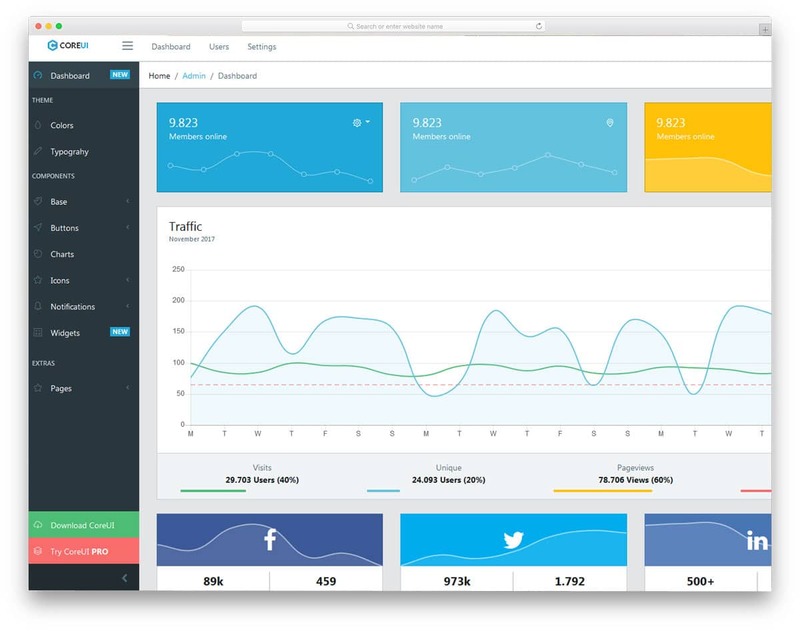 For analytics dashboard, this template would be a great choice. My Admin Lite is also a lite version of a premium template just like the Ample Admin Lite mentioned above. Both the templates are from the same creator, but the My Admin Lite template uses a different design. The only similarity is the clean design and light theme color. This admin template can be used for the user profile management and activity tracking. In the dashboard, you have the option for traffic stats, todo list, and message board. In the top bar, you have the option to include user profile details and search bar. With this template, you don’t have the option to minimize the side navigation bar. Since it is a lite version you only have a limited amount of elements and options. If you are about to use this template make sure the options given are closely related to your needs because in order to customize the template you need to upgrade to the premium version. Pixel Admin is a flat style content rich HTML admin template. This template uses a minimal design with washed out color scheme, but the designer managed to not to make the template look very dull with the color scheme used. This minimal design helps you to stay focus on your task and see the contents neatly without any distraction. The left navigation bar is made sticky for better navigation and user experience. With this template, you get charts and blocks for messages and comments. Other useful features you get with this template are tables, font awesome icons, Google maps and 404 page. Monster Admin is a perfectly designed admin template which we have already mentioned in our previous collection. Design wise this template is a premium quality one. Only where this template lack is the features. Since it is a free admin template you get only a limited amount of options. The default options make this template a perfect fit for blog website admins. With this template, you get Sine wave chart, projects of the month and recent posts. At the top bar, you have the option to include user profile info and search bar. If you are searching for a simple admin template with modern web elements then Monster Admin is worth trying. Material Pro Lite as the name implies this template uses material design. With the trendy colors and flat design, this template meets the design needs of millennial users. The clean design helps the user to see the stats and other details clearly. By default with this template, you get bar charts and circular chart. The use of visual effects for the charts to show the stats gives an interactive user experience. All the profile settings and details are shown in the dashboard itself, along with it you also get the option for the contacts. In the left navigation bar, you have the option for dashboard settings, email and logout button. Since this template is optimized for the mobile view the users can access their dashboard easily from their handheld devices as well. 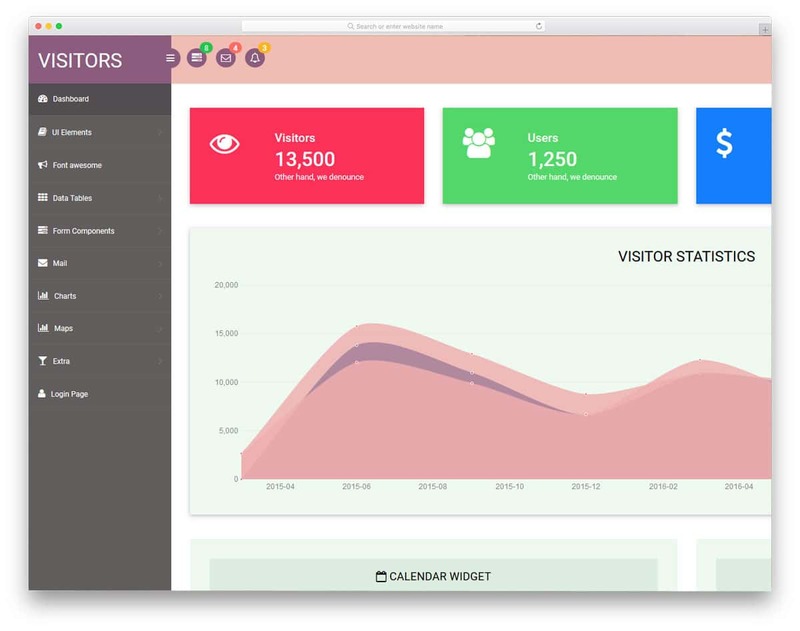 Visitors are the only colorful dashboard in this free HTML admin templates list. The use of different colors for the segments gives this template a refreshing look and also make it stand out from the rest of the admin templates. In order to balance the colorful background different color web elements are used. The colors used in this template are neat and trendy, each color is chosen with care to make this template the best fit for professional use. The left navigation bar is made transparent to make it easily adapt to the different background colors used. With the Visitors template, you get plenty of elements for customization. Like in the freemium template you are not locked with limited options and elements. Like most other free HTML admin templates mentioned in this list, this template also uses font awesome icons. With this template, you get elements like forms, charts, maps, and tables. 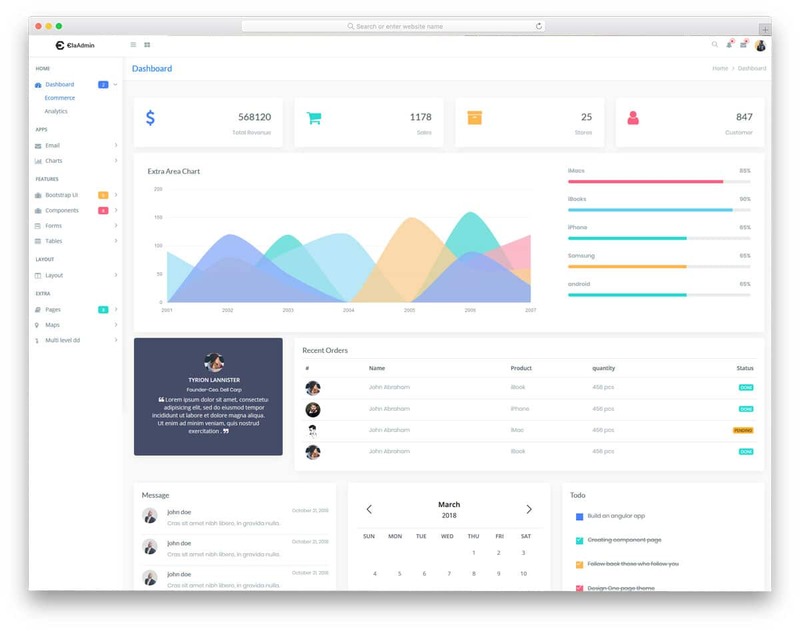 Colored is a bold looking modern dashboard template. To make use of the full-width design this template uses big content blocks and colorful charts. Each content blocks is bounded by thick borders. The unique feature of this template you have a live chart, so you have to monitor live stats this element will be of great use to you. The visual effects are mild and sleek which manages to get the user attention at the right time. The navigation bar to the left is designed to be hidden all the time until the user hovers over it, this lets the user enjoy the stats in the big screen without any distraction. Pooled Admin is a boxy style template. This template includes all the necessary features you would normally expect in an admin template. Since you get many options, customizing the template is an easy job. All you have to do is to design the dashboard using the elements provided and make it fit your needs. To avoid users from getting bored by the same web elements, different colors are used for different blocks. The bold texts help the user to read the texts easily. Hover effects are used to show the stats details on the charts. You get minimizable navigation bar on the left. Esteem is a practical admin template. The design and the elements you get with this template are inspired by the day to day admin usage. So the user will also find it useful to use it in their day to day task. The designer has made use of the full screen effectively with different dashboard elements. 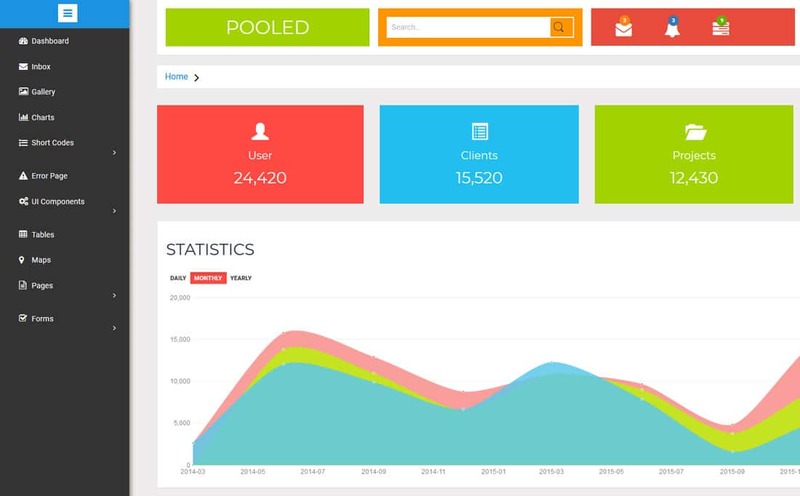 Ample amount of space is provided for the dashboard elements based on the data displayed on the blocks. In the top bar, you have the option of including profile details and settings. With this template, you also get the option for full-screen mode. By default the navigation bar is hidden at the top left corner, if needed you can expand it for better navigation. Ember is a creative and unique admin template in this free HTML admin templates list. This template is primarily designed for the Twitter monitoring based on the geolocation of the user. And this template is in a perfect working condition since it is already integrated with the Twitter API. Most of the backend work related to Twitter is taken care in this template. If you are looking for an admin template with a concept related to Tweets, then you will find this template useful. The visual effects on this template are also neat and sleek. As this template needs to show multiple tweets at the same time mild animation effects is the best choice. This template provides you the option to hide the sidebar navigation completely from the screen. Another useful feature is this template also have a second version, which is similar to the normal HTML admin templates mentioned in this list. Overall the Ember is a feature-packed template for both the developers and users.